Want to put flour/liquid/ingredients directly on the mixers bowl of the center,not on the counter? Keep Your Stand Mixers Ready and Accessible with JOYMOOD Universal Pouring Shield. 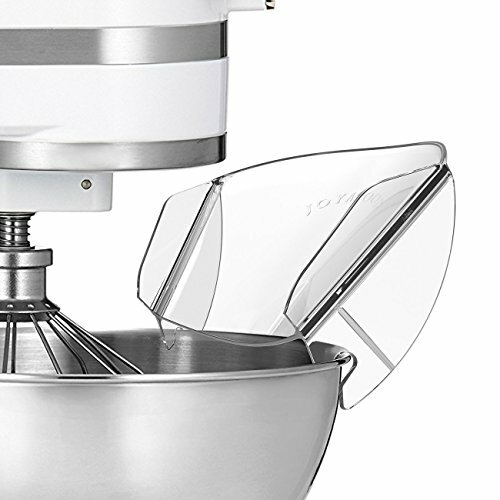 This pouring shield chute is additional attachment to Kitchenaid electric mixers which comprehensively place it over the rim of the metal mixing bowl and add your ingredients,neat and convenient,no messy in your kitchen.thereby replace traditional clumsy pouring chute,dishwasher safe,to save your space and money. ☞Why choose JOYMOOD Universal Pouring Shield? Our pouring cover made of the high-grade transparent density plastic that will not bend or wrap during rigorous use,stable,durable, waterproof and lightweight. Designed specifically to fit any metal mixing bowl,the pouring chute works with all stand mixer brands. However it is not recommended for use with glass bowls or bowls with a flared edge. Attach and lock the pouring chute into place with one quick motion.It doesn't get in the way of the paddle rotation and won't interfere with mixing. This is a great replacement for the bulky pour shields which are standard with most mixers. Easily add ingredients to your mixing bowl and keep your counters clean! The Pouring Chute directs food into the center of the bowl for better mixing and is ideal for both wet and dry ingredients. 1.Take off the pouring chute first before you use. 2.Do not adjust mixing head or bowl height during you use . Any question,pls contact our team freely,and we will reply you within 12 hours! [100% Guarantee] 100% money back guarantee! Manufacturers are responsible and guarantee you long lasting pouring chute for your Kitchen work. If it is not COMPATIBLE for your machine, just return and ask a refund! If you have any questions about this product by JOYMOOD, contact us by completing and submitting the form below. If you are looking for a specif part number, please include it with your message.